After spending years enjoying regular visits to Italy, I had yet to visit Milan. Considered the economic and fashion capital of the country, Milan is a perfect destination to enjoy on a weekend away or while connecting elsewhere in Europe as its airports and train station offer an excellent travel hub. I’d heard mixed reviews of Milan…there’s a reason I left it to last. North Americans who are looking for a dreamy Italian holiday on par with Federico Fellini’s finest are often disappointed as Milan doesn’t hold the romantic charms of Florence, Venice, Rome, or the Amalfi Coast. Milan is cosmopolitan at its core…so if you love visiting London, New York City, or Tokyo you’re sure to find happiness here. I loved the Milanese passion for lush greenery—her parks are plentiful and locals display potted plants on their balconies with great gusto. The sweet smell of frangipani will forever be imprinted on my memories of the city, as I spent hours walking through busy streets, constantly amazed by the parade of fashionable people. What I loved most about Milan was its ever-present dichotomy: a historic art collection contrasted with a massive contemporary art centre, and fine Italian feasts enjoyed a short stroll from a bustling China Town. Rightfully known as the world’s cutting-edge curator of furniture design and high fashion, the city is just as excited to share its ancient treasures as it is to throw itself into the future. I researched my trip in advance using Eyewitness Travel Top 10 Milan & the Lakes (DK Publishing, 2018), sketching out a three day itinerary, which would have me wandering through Italy’s largest city with ease while taking in top attractions and nibbling on famed local delicacies. 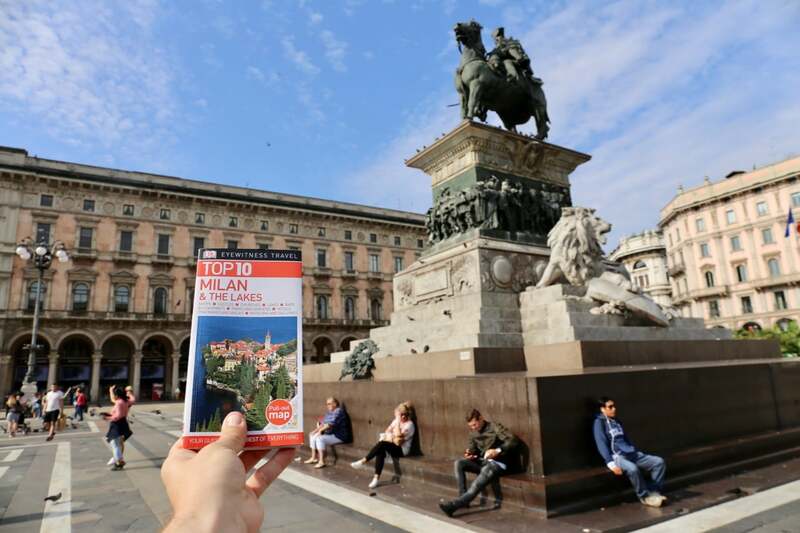 The handy travel guide is an essential read for those planning their first trip as it outlines which attractions you need to book in advance (Leonardo da Vinci’s The Last Supper) and how to best tame Milan’s Metro (zig-zag all over the city in 24 hours with unlimited trips for just 4.50 EUR). Easy to Use: Each chapter lists the Top 10 things you should experience at a particular attraction, so if you’re time crunched or don’t want to miss out on exploring a museum’s star attraction, it’s an invaluable resource. Includes Map: In the book’s back pocket you’ll find a detachable waterproof map, which comes in handy when you’re running around on a rainy day. I always had it neatly folded in my pocket to ensure I never got lost on the city’s dizzying Metro. Great Top 10 Lists: The first few chapters of the book are dedicated to the Top 10 most visited attractions in Milan while the remaining are niche lists for those who have unique interests. Examples include Moments in History, Churches, Festivals and Events, and Notable Buildings. Insider Tips: The guide is full of useful insider tips and tricks that answer a lot of great questions you might not even think to ask. Milan’s star attraction is Leonardo’s da Vinci’s The Last Supper, and while you might think you can grab a ticket upon arrival, you’d be wrong. You’ll need to book your visit months in advance online or pay for a last-minute four-hour bus tour, which guarantees a ticket. I often find I have the most authentic experience while travelling when situated outside of the tourist zone. Milan Marriott Hotel is located just a 10-minute subway ride from the Duomo, in a relaxed suburban neighbourhood filled with restaurants and bars frequented by locals (there was not a tourist in sight other than yours truly). 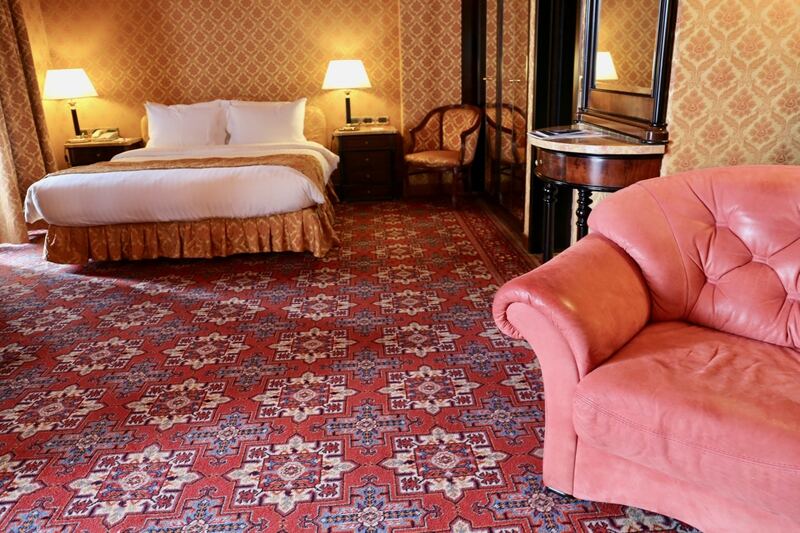 If you’re looking to enjoy a slice of luxury in Milan at a decent discount, book yourself into one of the hotel’s Junior Suites, featuring a spacious room with king-sized bed, walk-in wardrobe, marble bathroom, private balcony, and access to the hotel’s Executive Lounge. 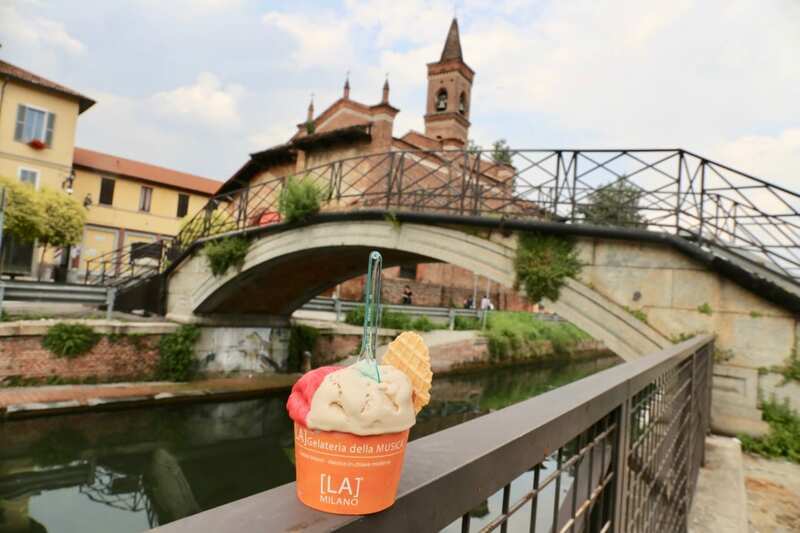 Head to Milan’s Navigli neighbourhood after work hours and you’ll find a bustling canal district filled with trendy restaurants and bars. 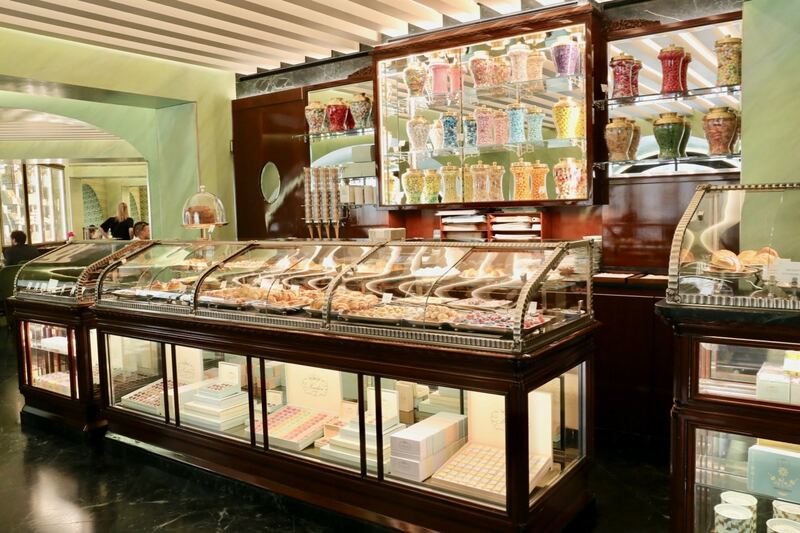 If you’ve got a sweet tooth, make sure to visit La Gelateria della Musica, one of the city’s most famous gelato shops. Highlights include Basil with Lemon, Peanut Butter and Strawberry Jam, and classic Pistachio. 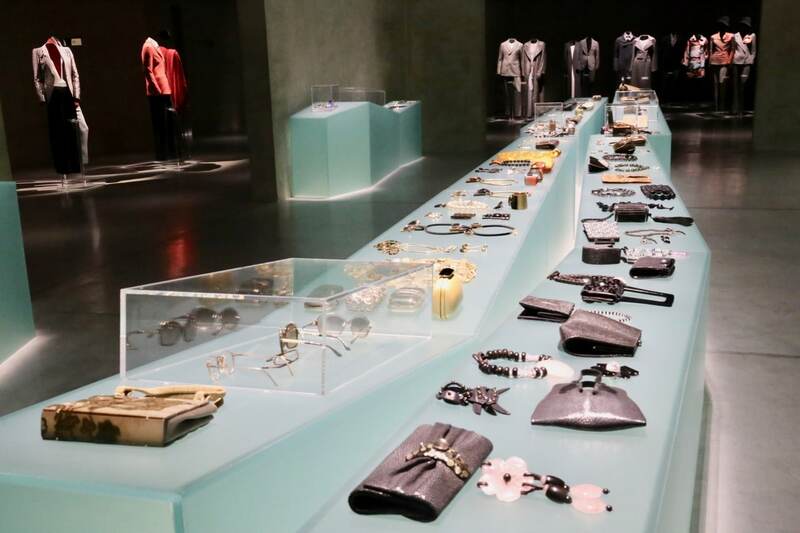 Also located in Navigli, Armani Silos is a museum which doubles as a mecca for fashion fans. The 4,500-square-metre space is spread over four floors and houses a unique selection of the iconic Italian fashion designer’s creations from 1980 to the present. The selection does not follow a chronological order but is divided into themes that have inspired and continue to inspire Giorgio Armani’s creative work. Visitors find inspiration while prancing past mannequins dressed to impress with themes dedicated to Stars, Daywear, Exoticism, Colour Schemes, and Light. Milan’s architectural icon is the magnificent Duomo, which took almost 430 years to complete from its 1386 inception to the finishing touches in 1813. It is the fifth largest church in the world, with over 3,500 exterior statues, and it’s held up within by 52 massive stone columns. Once inside, take your time to explore the cathedral’s spectacular stained glass windows, awesome organ, and marvel at the haunting statue of St. Bartholomew Flayed. 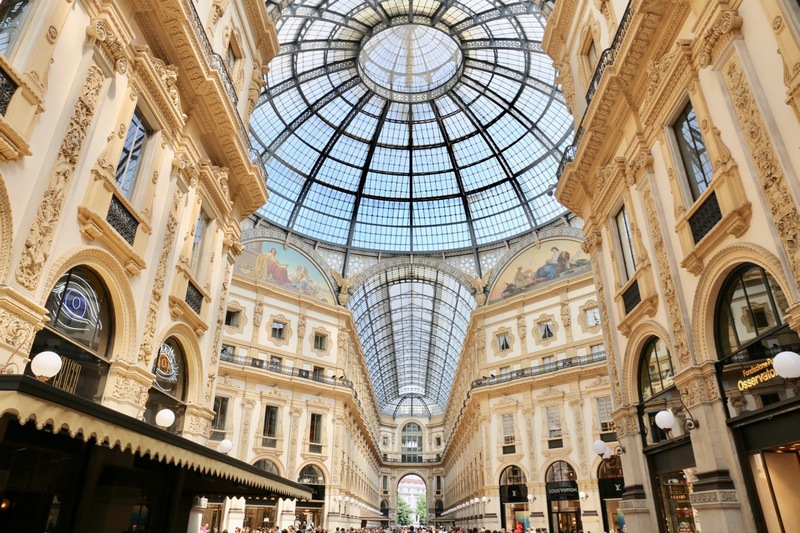 Cross the street from the Duomo and enter one of the world’s most spectacular shopping arcades, Galleria Vittorio Emanuele II. Housed within a four-story double arcade, the Galleria is named after the first king of the Kingdom of Italy. It was designed in 1861 and built by architect Giuseppe Mengoni between 1865 and 1877. On weekends, the place is packed with a sea of selfie sticks. Stand at the centre, directly under the glass dome, and you’ll find yourself surrounded by haute couture, including shops by Louis Vuitton, Prada, and Versace. If you’re looking for the ultimate spot in the city to sip a cappuccino, skip up the steps to Marchesi 1824. The iconic café located within the heart of the Galleria serves high quality espresso, pastries, and colourful candies from picturesque glass jars. Visiting opera fans and theatre nerds can explore Milan’s iconic Teatro Alla Scala for an opportunity to peek into the theatre’s lavish red and gold space from the perch of a VIP boxed seat. 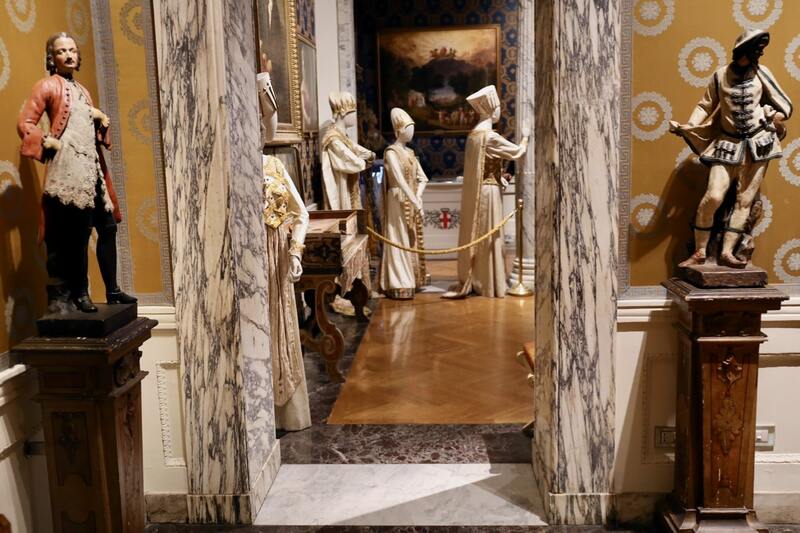 Afterwards stroll through a petite museum dedicated to the history of Italian opera, featuring details on Milan’s most celebrated singers alongside props and costumes from the city’s favourite performances of the past. I’d be lying if I didn’t say that I visited Milan with the sole purpose of finally resting my eyes on Leonardo da Vinci’s The Last Supper. 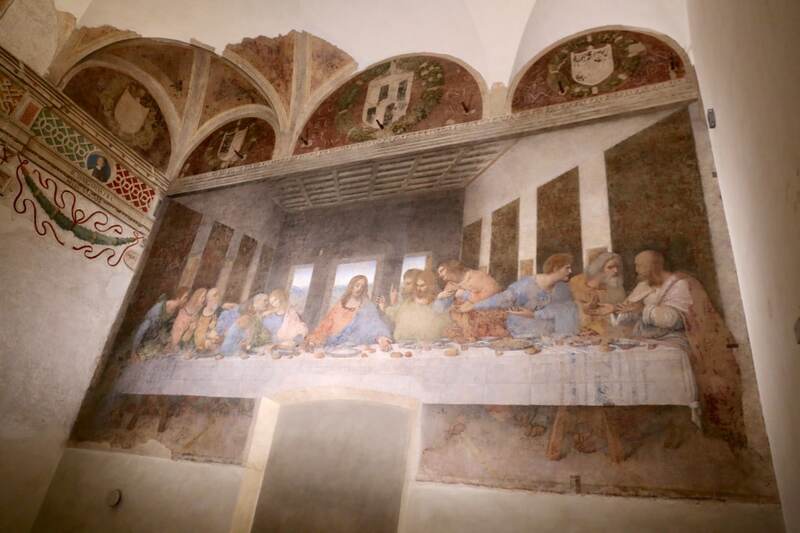 The world-famous artwork was painted between 1494 and 1498 on a wall in the dining room of the former Dominican convent of Santa Maria delle Grazie. In order to create this unique work, Leonardo carried out exhaustive research and created many preparatory sketches. The most recent restoration was completed in 1999, using several scientific methods to restore the colours as close to their original appearance as possible, and to eliminate traces of paint applied in previous attempts at restoration. Visits to The Last Supper run like a well-oiled machine. Small groups are given 15-minute timed tickets to experience the space, so once inside forget about blinking. 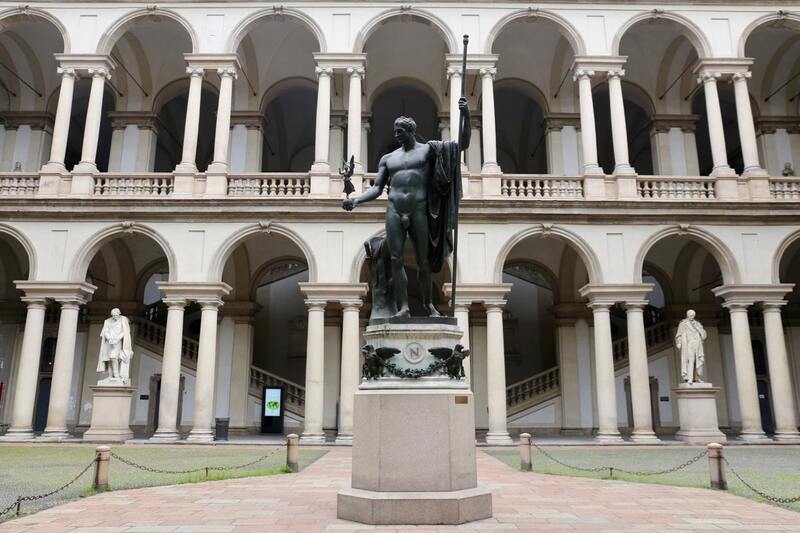 Art fans looking for a dose of classic Italian art find happiness at Pinacoteca di Brera. The museum is unique among Italy’s major art galleries in that it isn’t founded on the riches of the church or a noble family, but the policies of Napoleon, who suppressed churches across the region and took their treasures off to galleries and academies. Over the last two centuries, the collections grew to take in some of the best Renaissance-era paintings from Northern Italy, representatives of the Venetian school, and several giants including Raphael and Piero della Francesca. My wildest surprise in Milan was taking the subway to the northern reaches of the city and then hiking to the spellbinding Pirelli HangarBicocca. The impressive ode to contemporary art was established in 2004, in a converted former industrial plant. This dynamic centre for experimentation and discovery covers 15,000 square metres, making it one of the largest contiguous exhibition spaces in Europe. It presents major solo shows every year by Italian and international artists, with each project conceived to work in close relation to the architecture of the complex. The complex features three exhibition spaces whose original twentieth-century architectural features have been left clearly visible: Shed, Navate, and Cubo. 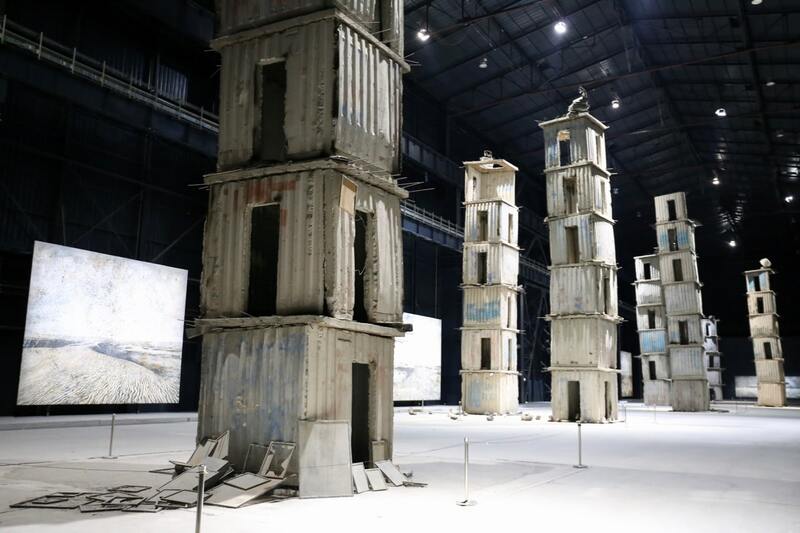 As well as its exhibitions and cultural events, Pirelli HangarBicocca also permanently houses one of Anselm Kiefer’s most important site-specific works, The Seven Heavenly Palaces. Most importantly, admission to the space is free of charge. 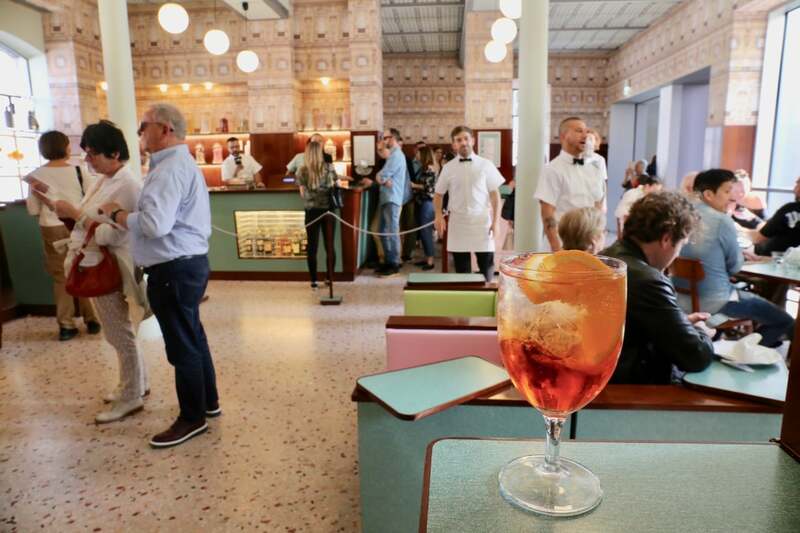 If you’re looking to find the perfect spot to people watch while sipping an Aperol Spritz, head to Bar Luce at fashion-forward Fondazione Prada. Designed by acclaimed American film director Wes Anderson, Bar Luce recreates the atmosphere of a typical Milanese café. Some architectural and decorative details from the original structure have been preserved, such as the arched ceiling, which recreates a miniature version of the vaulted glass roof of the Galleria Vittorio Emanuele. In keeping with the interior design, the seats, formica furniture, floor, veneered wood wall panels, and the range of colours employed are reminiscent of Italian popular culture and aesthetics from the 1950s and 1960s, echoing artistic decisions Anderson made years earlier for his short film Castello Cavalcanti. The place gets insanely packed on weekends when dapper locals and chic tourists descend on the museum, so try your best to visit during the week to avoid the crowds. Eating and drinking in Milan is an attraction all unto itself. 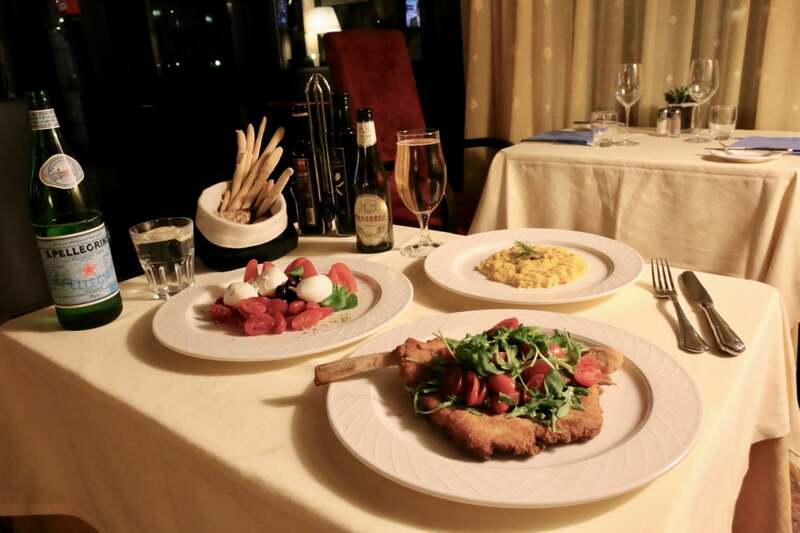 Must-try dishes include Cotoletta alla Milanese (always served with sliced tomatoes and arugula), fragrant saffron-scented Risotto Milanese, hearty Ossobuco with creamy polenta, and other Lombardy classics such as Tortelli di Zucca, Panettone, and gorgonzola. 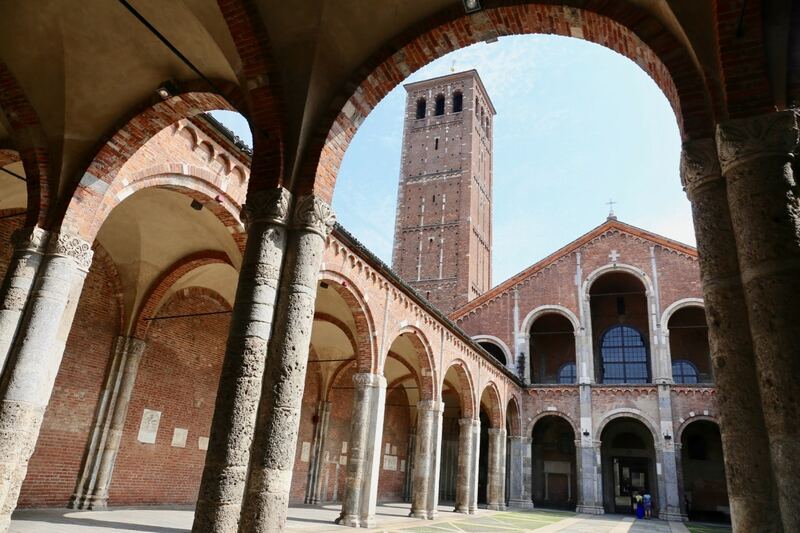 One of Milan’s oldest basilicas (founded by St. Ambrose in 379) Basilica di Sant’Ambrogio served as a model for most of the city’s early medieval churches. 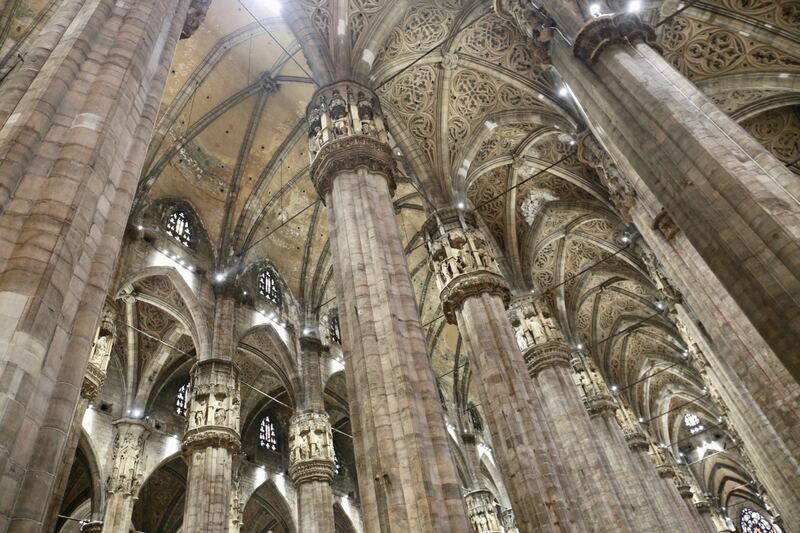 It instantly became Milan’s most beloved house of worship when the wildly popular Ambrose was buried here in 397. The courtyard features a balanced facade that consists of five arches fitted under a peaked roofline and flanked by two mismatched towers. Inside, make sure to peek up at the dazzling apse mosaic depicting Christ Pantocrater pieced together between the 4th and 8th centuries. If you’re famished and looking for a bite, there’s always a line snaking down the street at Luini. 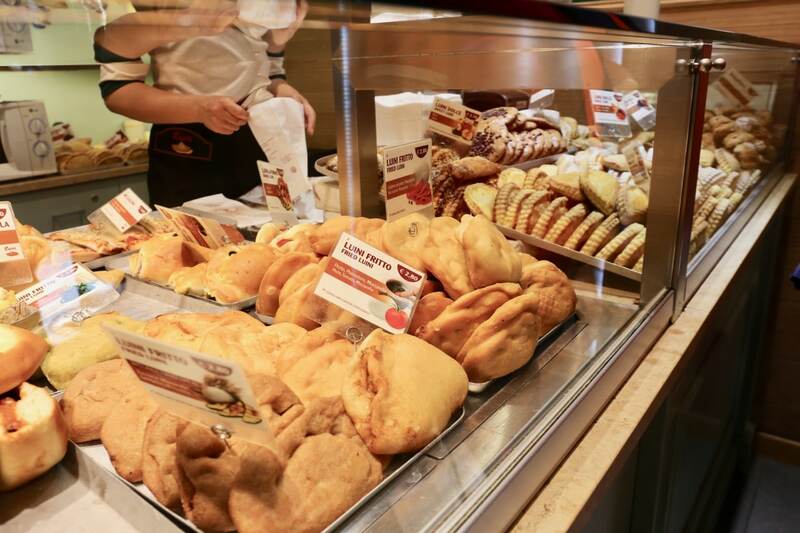 Located a stone’s throw from the Duomo, Luini has been serving panzerotti, Italy’s favourite street food, since 1888. You’re spoiled for choice with the restaurant’s epic menu, featuring baked and deep-fried savoury snacks as well as sweet options for dessert. Be sure to order Luini’s signature fried panzerotti filled with ooey gooey mozzarella and spicy salami. Eyewitness Travel Top 10 Milan & the Lakes doesn’t just focus on things to see and do in the city. It also includes popular day trips, most notably to the posh Lake Como region north of the city, as well as quaint villages in Lombardy. I was curious to explore the other side of the lakes, hopping over the border to the Swiss side where I spent a few days soaking up the sun in Lugano. Eyewitness Travel Top 10 Milan & the Lakes has a page dedicated to Switzerland (p. 110) for those looking to enjoy a uniquely Swiss experience in the region. If you’re a lover of alpine hikes accompanied by jaw-dropping panoramic views, Monte Generoso is just for you. It is one of the most famous and beloved mountains in Ticino, surrounded by Italy on all sides. Up top visitors are blessed with views of the surrounding lakes, town of Lugano, Po Valley, and impressive mountains from the Apennines to the Gotthard massife. 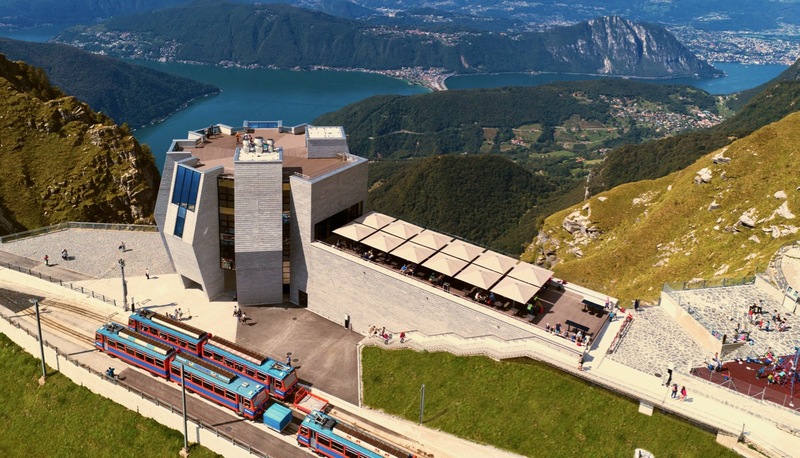 Day-trippers arrive at the mountain’s peak on a scenic cog train and are greeted by “Fiore di Pietra,” architect Mario Botta’s now iconic stone flower. The four-storey building features a rooftop terrace, elegant fine dining restaurant with floor to ceiling windows (you’ll gasp at the amazing views while forking up your pasta), and a small gallery space which hosts rotating exhibits. Adventure seekers can enjoy alpine hikes along numerous trails, hire a mountain bike, or enjoy the hair-raising paraglide flight of your dreams.